A-one Zune Video Converter as its name suggests,can be played on Microsoft Zune. 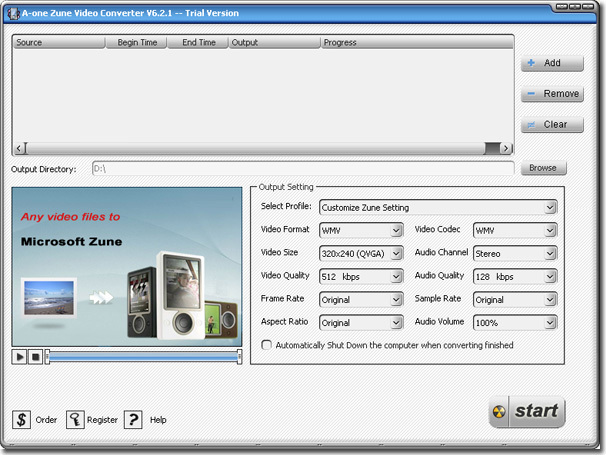 A-one Zune Video Converter is a powerful video to zune converter software, and can be use to convert popular video to Zune or MPEG-4 format that can be played on Microsoft Zune Player. It is capable of converting DivX, XviD, MPEG, MOV, MPG, MOD, QickTime, MP4, 3GP, 3G2, SWF, GIF, DV, MJPEG, VOB, WMV, ASF, AVI to Zune or MPEG-4 video format. ...... So with it, you can convert both DVD media and video file media to Zune video and enjoy your favorite DVD and video clip on your Zune as a portable DVD Player. 4).conversion speed is 2 times of the playback speed. 5).Set the start position and end position of source file to convert. 7).Support many predefined profile setting for Zune video. 8).Customize the quality of output Zune video. 9).Automatically shutdown your computer after long time conversion , such as for big files conversion at midnight. Qweas is providing links to A-one Zune Video Converter 6.9.31 as a courtesy, and makes no representations regarding A-one Zune Video Converter or any other applications or any information related thereto. Any questions, complaints or claims regarding this application A-one Zune Video Converter 6.9.31 must be directed to the appropriate software vendor. You may click the publisher link of A-one Zune Video Converter on the top of this page to get more details about the vendor.